When I was in middle school, I would have told you that pink and green were my favorite colors. Green (obviously) stuck, but pink did not. When I started playing basketball in high school I decided that pink was too prissy for me and I have hardly worn it since. However, this shirt I can handle. The pink is subtle and I love how feminine it is. I must also acknowledge that this is the first time I am baring my legs this year. Even though it hit 70 degrees yesterday, it still feels a little strange. Probably because when I showed my husband this outfit, he looked at me kind of strangely and said "are you wearing white tights?" Um, no, those are my legs. It's been too long, sun, it's been too long. Green Week Link up is after the break! That's a super cute blouse. 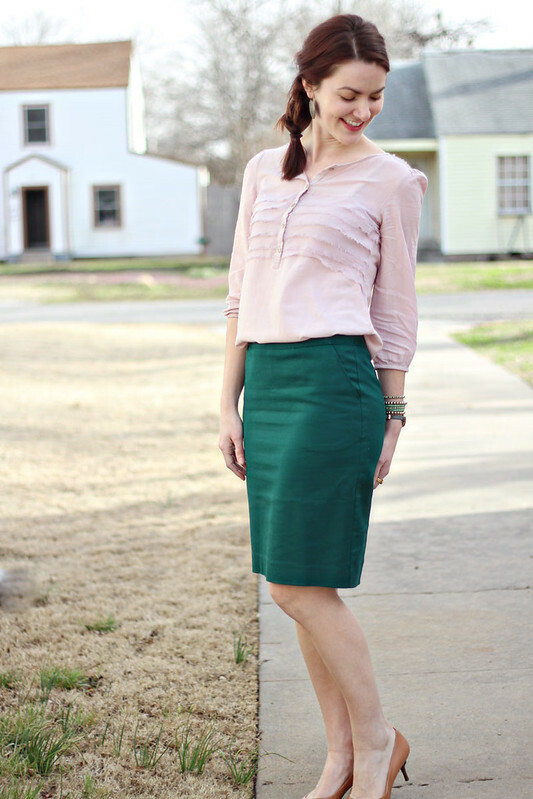 The soft dusky pink goes so well with the forest green skirt too, I never would've thought of pairing them together! Ohh 70s! How lucky! I think we all had a time when we were obsessed with pink, and then that time passed. But I'll still wear it once in a while. Oh husbands! Sometimes they just need to think an extra second before speaking. I'm in the same boat with super white legs, but I don't care because I'm just so happy to have a little warmth (as I look out at the snow again!). I think pink and green are my current favorite colors. When I was younger, I was a total tomboy, but then I realized that I didn't actually like being a tomboy and it was probably just because I was the only girl in the neighborhood. So now I'm pretty "girly" when it comes to things. I love these colors together! Pretty top! Thats hilarious! My legs are just as white as yours girl! I think pale is pretty! Like this color combo! Haha I laughed about the white tights. My legs are definitely looking like they are donning white tights right now. But it's still too cold to show them here! 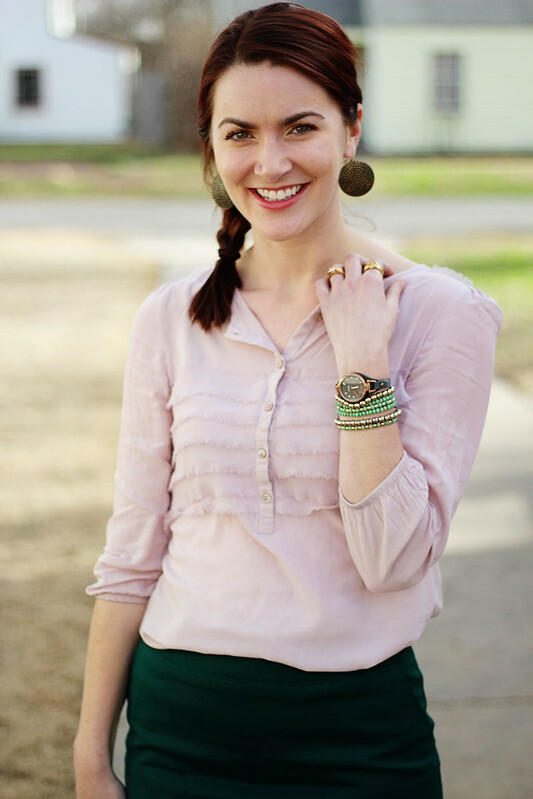 I really like pink and green together, and this blouse is so pretty! I really like this color combination! At least your legs are a healthy, natural color. When I was younger (and dumber) I used to indoor tan (but never to the point of being orange). Now when I see my students with tan legs during this time of year, I just want to go Mom on them and lecture them on the hazards of tanning. On a separate note, you look really cute with a side braid, and I really like the earrings you chose. I've never thought of wearing bigger earrings when I sport a braid. What a great idea! I love that color pink on you! It's such a nice shade. Your legs look fine, it really doesn't look like you are wearing tights or too pale! I'd rather be pale than be caught tanning! Ah you look great in pink--and green!! Ha my hubby has said the same thing about my legs lol makes me wanna give him a whack!! 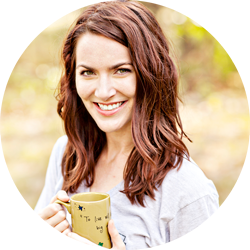 You look gorgeous though :) Can't wait to meet some fun new ladies through the link-up! Thanks for hosting. 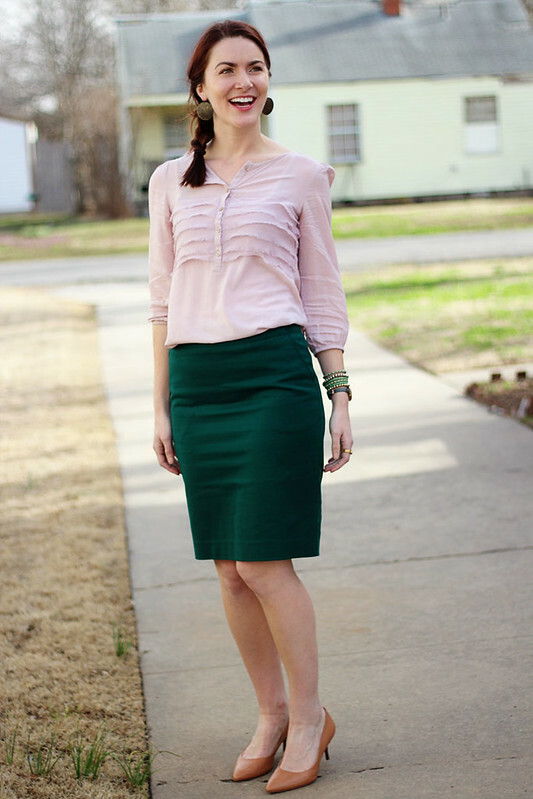 I totally agree, blush pink is so flattering and "wearable" on everyone! You look beautiful! These two colors are like peanut butter and jelly! The perfect mix! Also your green skirt is such a pretty shade of green. I feel your pain about the white legs. My legs are so white people are going to need sunglasses! Oh, he just said that to get a rise out of you! Your legs aren't white. That's funny though. 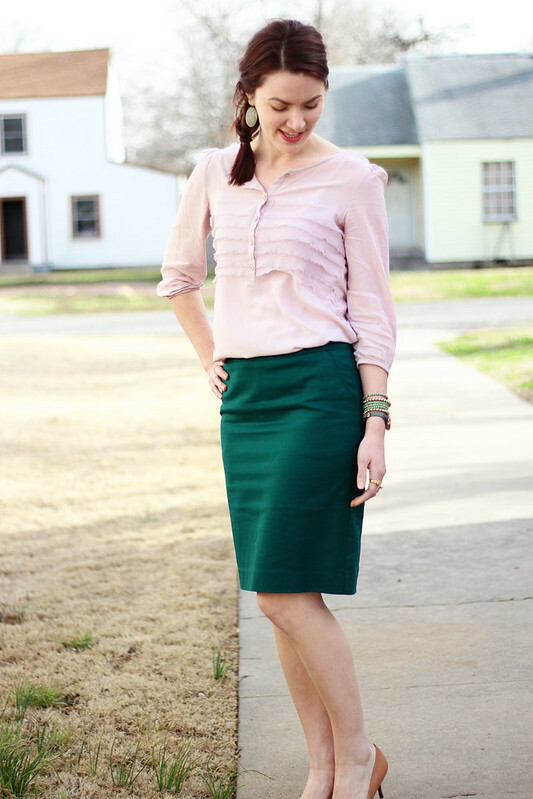 I really like this combo of blush pink and hunter green. Great combo! Funny but not funny. :-) I think that shade of pink is considered Blush. Cute pics! You are seriously adorbs! 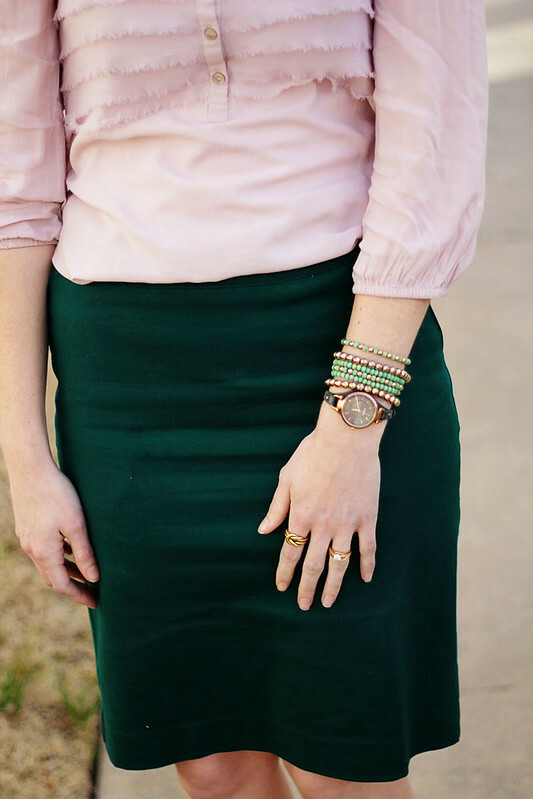 Love the emerald skirt! Looks so perfect with the blush top! I love pink and green together! And you need to jump back on the "Pink is awesome" train! Now I want to recreate this color combo! I have a skirt and top almost exactly like that. I must try it to see if it works in a bohemian style. When I do I will link back to you! Thanks for the idea! Green is my favorite color too! I even had the walls in my room painted green as a kid :) Right now my favorite shade of green is emerald - it makes my heart skip a beat whenever I see gorgeous clothes in this color. That skirt is beautiful! Also... brr. Way too cold for naked calves here! Haha. That white tights comments made me giggle. That's so totally me too! great color combo! reminds me of a flower - perfect for spring! One of your best outfit, Ashley! And the braid suits you! I love your husbands white tights comment. Bless! I am very pale, all year round, in a mixed race family! I call it porcelain and I am owning it/rocking it/working it/whatever expression embarrasses the kids the most! Oooh, that pink blouse is GORGEOUS. I've been SUPER into that pale pinky/blush color lately. It's just so elegant - and I love how it looks with other colors and most neutrals, too.